Grey, Andrew. 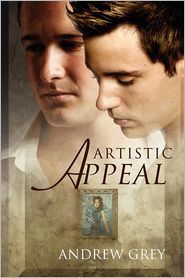 “Artistic Appeal”, Dreamspinner Press, 2011. With the amount of reading that I do I have discovered that there are several authors that always provide a good read. One of the top names on that list is Andrew Grey. Not only is his writing excellent, Grey is an excellent storyteller. His new book, “Artistic Appeal” is proof of that. Brian Watson, Gerald Young and Dieter Krumpf are good friends but Brian is fairly sure that Gerald and Dieter have an ulterior motive for inviting him to their Christmas party. Brian is a hard worker and he has been given a case to make sure that a painting, “The Woman in Blue” is returned to Dieter but his friends are afraid that he is working too hard and not enjoying life. The plan was to set Brian up with a friend but Brian has eyes for Nicolai, a deaf artist who has been restoring the painting for Dieter. Brian has his work cut out for him as Nicolai is no easy catch. He is still getting over a relationship that ended badly and he has just learned again how to be independent and is not ready to give that up again. His ex, Justin, also wants him back. To further complicate things, Brian has never really come out and has to find a way to tell his ex-wife, mother and daughter that he is gay. When Brian got the case, he came out to his friends and they want to help him come to terms with his sexuality and meet a nice guy. When Brian and Nicolai see each other, the attraction is instant for both guys. Because Nicolai is deaf, Grey has to create a world that is silent and he does just that. I actually felt that I was in that non-hearing world of reading lips, gestures and sign language. I can only imagine the amount of time it took the writer to do this and the result is amazing. Furthermore, because we are not hampered by sound, we get a love story that is pure and quite beautiful. The book is a follow-up to “Legal Artistry” and the story picks up where the prior book ended, with Dieter undergoing the legalities of getting his family’s art collection back to his family. It is not necessary to have read “Legal Artistry” to understand this book as both books stand on their own. Thank you so very much Amos. I’m so very pleased you liked the story.